Bezalel is an unpopular name and only mentioned few times on the Bible. He didn’t divide the sea as Moses did (Exodus 14:21-22), he didn’t stop and make the sun and the moon stand still as Joshua (Joshua 10:12-14) and he didn’t bring a dead boy to life like Elijah (1 Kings 17:17-24). His name is not even written in the witnesses of faith as Bible recorded in Hebrew 11. But God used this ‘ordinary man’ to lead the entire gifted artisans who were working in order to build the tabernacle and all the furnishings inside which God has commanded Moses. So, why did God choose Bezalel? And who is Bezalel actually? Bezalel is Hur’s grandson. Hur was a faithful follower of God. He was together with Aaron held Moses hand up so Israelites can win over Amelekites in Rephidim (Exodus 17:8-13). What does that mean? Hur was a considerate and obedience man to his leader. He supported his leader’s vision and he loved his people. It was not an easy issue for Moses to trust someone. Hur was not living mischievously. He was a righteous man and fear of God. What is the relevance between Bezalel and Hur who lived righteously? If we are the righteous… if we have applied the value of Kingdom of Heaven in our life… it means that we are INVESTING God’s blessings and favor for our future offspring. Be joyful for our descendants will be used by God and become a blessing. Was Bezalel blessed by God because he was merely from a righteous ancestor? Of course not. What will happen if we are not the descendant of the righteous? No problem. God will bless and use anyone who give their life and follow Him with whole heart. Let’s start to build our family in God’s way. The meaning of Bezalel is “in the shadow of God”. Those who dwell in the shadow of God will be there in the place where God is. They love to stay in God’s presence and covered by God’s protection. God paid Bezalel favor not simply because he came from a righteous family, but because he lived in righteous way. Bezalel drew his life near to God. 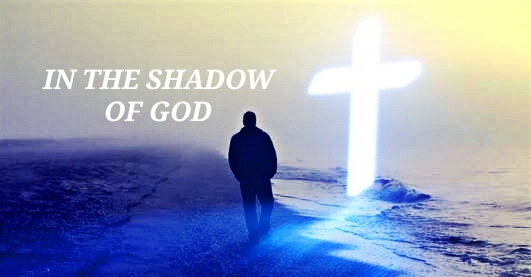 He dwell in God’s shadow. He built strong relationship with God, so he knew God. That is the reason why Bezalel did the exact things as God has commanded him, though to set up the tabernacle and to build all the instruments were difficult because the shape and size should be precise according to God. “And Bezalel and Aholiab, and every gifted artisan in whom the Lord has put wisdom and understanding to know how to do all manner of work to the service of the sanctuary, shall do according to all that the Lord has commanded.” (Exodus 36:1 NKJV) To did all he need total obedience to God. Only those who obey and dwell close to God can do exactly the will of God. My beloved brothers and sisters in Christ, if today any of us who feel that we are “ordinary” based on the world view (Even we think about ourselves too), have nothing, and unaccounted, do not be discourage. Bezalel was an ordinary man but he diligently sought God, built his life in God. Be like Bezalel, let’s start to build our relationship with God every time, walking together with the Holy Spirit and abide in His Words. If we always live in “the shadow of God”, there will be a time that God will lift us up. He will give us a bigger responsibility when we ready to do it with Him. Holy Spirit will equip us with all we need to do His jobs. He will help us to explore our talents. He will add even multiply our talents so we can be used by God according to His will. On the other hand, don’t be proud of ourselves if today God has blessed and used our lives. Everything is only by His grace! All in our life is God’s work! As how great God has anointed and used Bezalel, God will use everyone who is available. God can lift a shepherd become a king (David); God called a fisherman and used him to be a fisher of men (Peter) ; God changed a ploughman became a powerful prophet (Elijah). God also capable of turning and using a tax collector to become a follower of Christ (Zaccheus), also a man who fought against the Lord eventually became a radical apostle (Paul) and a lot more to mention. God is willing and able to transform, use, and equip everyone without exception, including you and me. God is not looking for ABILITIES, He is looking for the AVAILABILITY. Hello everyone! Glad and be grateful I could come back again with my new post. On the first week of this New Year, I got a lot of questions from my friends about what is my prediction for this year, especially in the business and finance field. Some of them shows their pessimistic in carrying out this year; they assume this year will not be better than previous. They even filled with anxiety in facing this year. “I didn’t dare to put hope too much, or even I didn’t have hope at all for this year. I think could be surviving day by day is more than enough” Said one of my friend pessimistically. My beloved friends, on my first post of this year I longs to talk about hope. In this today world that full of problems, affliction, and trials, there are many people losing hope in their life. For me, personally, this is horrible. I am not saying that I am definitely could do anything and will surely success in every field this year, but if until know I could work well it just because I have hope. I always put my hope on everything I do. I hope could get a better achievement in working. I also have a hope to be a better mother of my son; I hope could be a better wife for my husband. And also I hope could be a better daughter to my parents that has been entrust me to manage everything they build before. The point is because of hope I am able to keep moving. I found many people because they lose of hope, their lives like a programmable robot which is doesn’t have a soul; there is no longing in their heart to get a better future, and they don’t have dreams, goals, and vision to be achieved. They become people who are lazy to pursue a better future. What does the meaning of the verses above? Let’s ponder together. Let us focus on the word: “That who plows should plow in hope, and he who threshes in hope should be partaker of his hope” After I deeply reflect on these words, I conclude one important thing. We have to do everything in hope! Whatever we working on, we have to always put hope on it. This is an important message that will be able to make us continue to have dreams, goals and, vision in our lives, not just survive from day after day without any hope at all in our hearts. Don’t expect we have fire of spirit without hope. Without hope we wouldn’t be able to be diligent and get the best results. Hope will be able to help us be faithful and committed both where we work, in our profession or everything we strive in this world. Now the question is, when we already have a hope, where we have to put our hope? I also found many people today even though they have hope but they put their hope at the wrong place. They put hope on human’s strength, power, wealth, and other worldly things. It will definitely doesn’t work and will be in vain. As good as any humans still have weaknesses. No matter how powerful someone is, there is always someone more powerful. No matter how rich someone is, there is still someone richer. So where is the right place to put our hope? Well, has been clearly written in the Bible where we have to put our hope. Let’s take a look to the Holy Bible. Oh, what a wonderful fact! We have hope as sure and steadfast anchor of the soul, an anchor that can’t slip and can’t break down under whoever steps on it. 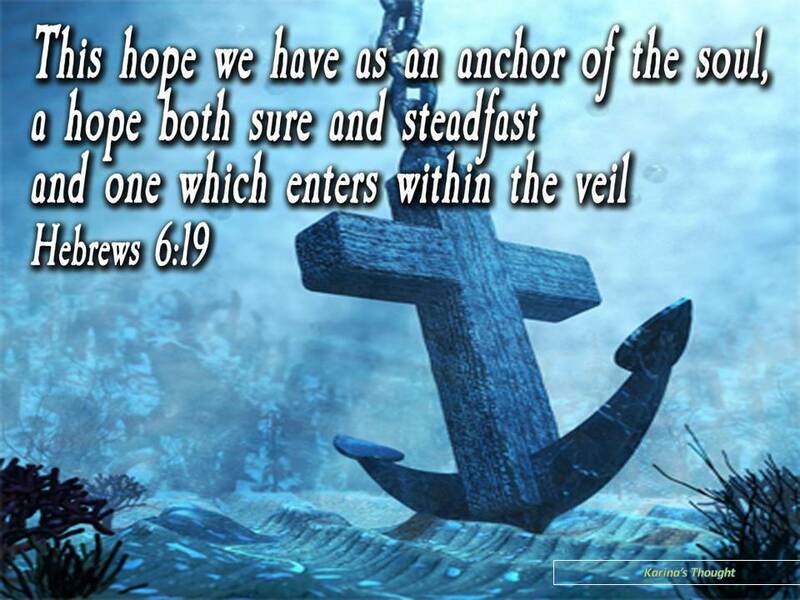 The powerful and safe anchor that we have is named the anchor of hope! If I likens our life is like a ship, we have Christ Jesus the solid rock that can be a strong and safe mooring for the anchor to hold and the ship of our life will remain strong and will be not tottering aimlessly.